Hello all! I wanted to do a quick post about a reading event I plan to take part in this December. 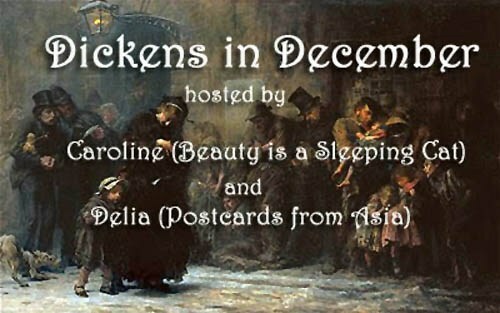 Caroline and Delia are hosting a Dickens in December event. Many of you may remember that I said I wanted to read ten novels by Dickens this year. I started off well and cruised through (as much as you can cruise through Dickens) six novels. And then I hit a wall. I took a break. I’ve realized that getting through the last four probably won’t happen this year. But I’m hoping to finish two more this December. I plan on reading A Tale of Two Cities and A Christmas Carol, which leaves Great Expectations and Our Mutual Friend for 2013. Caroline and Delia are hosting a readalong of A Christmas Carol that will take place on the 21st. If you love Dickens or if you want to read him for the first time, check out their event and join in on the fun. It isn’t limited to reading, but also watching movies based on his books. This entry was posted in Books and tagged 50 Year Project, A Christmas Carol, A Tale of Two Cities, Blog, Blogging, Books, Charles Dickens, Literature, Reading Challenges. Bookmark the permalink. Ahhhh …. a Dickens event in England …. sounds grand. Thanks so much for participating and mentioning this. I’m excited…and I should post my German review either tomorrow or the next day. Not sure I can join in at the same time, but I must get A Christmas Carol out of the library! I’ve never read it, can you believe that! Think you´ll enjoy it, especially reading it at this time of year! I’ve been saving it for Christmas. Tale Of Two Cities is great. Have a happy reading. Six out of ten still seems pretty good to me! Hope you have fun reading Dickens in December, TBM! Looking forward to reading your thoughts on ‘A Christmas Carol’ and ‘A Tale of Two Cities’. ‘A Tale of Two Cities’ used to be one of the favourite novels in my home when I was a child and we all used to discuss it. I look forward to discussing A Tale of Two Cities with you. I love Dickens and it will be good to get back on track with that challenge.